Two experts give their best tips for getting the most out of sprayers and spreaders. 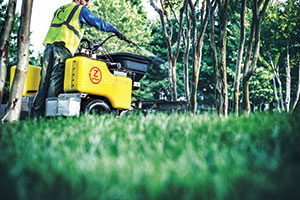 Common mistakes that lawn care operators (LCOs) make are they don’t stay consistent with the spray pattern and they don’t cut in edges near sidewalks and driveways, says Teddy Mathis, sales manager for Graham Spray Equipment, a manufacturer of spray rigs. Mathis knows from experience — prior to joining Graham Spray Equipment, he owned a lawn care company in the metro Atlanta area. Areas near sidewalks and driveways are often where a weed breakout might occur, he mentions. “You have to apply a little extra product there, and (applicators) typically do not,” he says. Tom Hackworth, category manager of equipment and safety for SiteOne Landscape Supply, says that aside from a consistent spray pattern, maintaining a consistent speed is critical. Hackworth says operators using tank sprayers have to ensure they are applying at the same speed all day and at the same speed they calibrated their sprayer. He warns that a majority of operators tend to apply product at a much slower pace towards the end of the day, which results in overapplying product. Another common equipment error is not calibrating equipment enough. “Even the best systems will not stay perfectly calibrated, and you should calibrate that equipment at least once a week, and we recommend doing it every morning before you leave for a job,” Mathis says. He explains that it takes merely a quarter of a gallon or one pound of product per 1,000 square feet to be off by this much. Overapplying can affect a company’s bottom line through excess product costs. Underapplying can result in having to retreat a property, which can lead to additional labor costs and loss of income. 3. Take advantage of the downtime. According to Mathis, one of the most expensive things in the lawn care business is downtime, so maintaining the equipment to manufacturer specifications is vital. Rinse corrosive chemicals off of equipment, change the oil in engines, replace the packing or diaphragms in the sprayer and drain the gas tank or include a fuel additive to prevent carburetor issues due to ethanol in the fuel — these tasks are essential to ensure spreader-sprayers stay in top condition. Hackworth says the most common issue SiteOne typically encounters in the spring is a broken sprayer pump due to improper winterization. Over winter, products left in the pump freeze, expand and break the pump. Winterizing the pump and hoses with an RV antifreeze is quick, easy and inexpensive, says Hackworth, noting that a few hours spent maintaining equipment in the winter means less chance of downtime in the spring once an LCO starts production. SiteOne also witnesses pumps breaking in the early spring. Hackworth says this situation happens when temperatures outside are slightly above freezing and a technician is driving from one location to another, and the windchill drops the temperature below freezing, potentially causing the pump to break. He recommends technicians simply run the sprayer/pump while traveling between locations to prevent pump breakage. 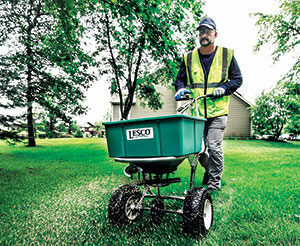 The average lawn care technician walks 6.5 miles a day, Mathis estimates, so ride-on spreader-sprayers are a valuable innovation to the industry. He cautions that all operators be aware of the capabilities of their ride-on equipment. He explains that top-heavy equipment is much better suited to higher-acreage, low-incline jobs, while others are made with lower centers of gravity and can handle more significant slopes. Abby Hart is the managing editor of Landscape Management. A native Clevelander, she spent 10 years in Chicago, where she was operations manager of a global hospitality consultancy. She also worked as managing editor of Illumine, a health and wellness magazine; and a marketing specialist for B2B publications. Abby has a degree in journalism from Boston University’s College of Communication.